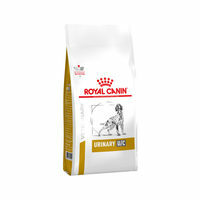 Royal Canin dog food was founded by Jean Cathary, in 1968, the visionary French vet who took up the mission to create a company that manufactures food based on scientific study and research. With sound knowledge about pets, through regular interaction with professional breeders and experts in the field, the company has identified the real needs of different animals. Today this premium brand formulates high quality pet formulas including Royal Canin dog food and has emerged as a global leader in providing health nutrition for dogs. These formulas contain over 50 nutrients all in precise balance to provide adequate nutrition for pooches based on their age, size, breed, lifestyle and specific needs. 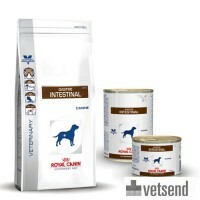 Royal Canin dog food provides healthy formulas for your loyal friend, to serve their specific dietary needs. The Veterinary Diet range treats animals that suffer from kidney or urinary ailments. This Veterinary Diet includes both dry and wet dog food that have been developed on scientific evidence to help dogs with gastrointestinal problems and other food intolerance. The range includes Gastro Intestinal for dogs with digestive disorders while the Gastro Intestinal Junior is specially formulated for puppies with gastrointestinal disorders. 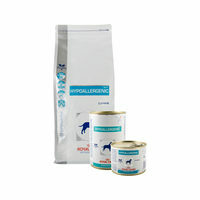 The Hypoallergenic formula is for dogs with food hypersensitivity and the Satiety is a diet to treat obesity in dogs. It contains a unique composition of dietary fibre that provides optimal satiety after meals. The diet treats provide effective options to improve your pet's life and support therapeutic treatment goals. A 200 lb. Mastiff's physiological needs are very different from a 2 lb. Chihuahua. Royal Canin dog food makes it easy to identify the right choice with tailor-made diets for each breed, size and lifestyle. Did you know that small breeds such as Toy Fox Terriers, Papillion and Pomeranians have surprisingly big nutritional needs? 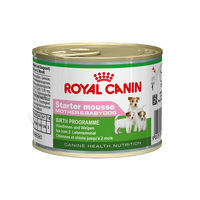 For this exact reason, this premium brand has come up with the Royal Canin Breed product range. Royal Canin also makes sure that every dog has the right diet according to size, by providing the Royal Canin Size range. XSMALL is dog food formulated especially for small breeds to keep them healthy and happy through the different stages of their life. 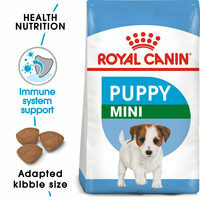 On the other hand the Royal Canin SMALL dog food is the healthy formula for small breeds that weigh between 9-22 pounds. These include Cairn Terriers, Boston Terriers, Bichon Frise, Maltese, Cavalier King Charles Spaniels, Whippets and Pekingese among others. This diet has been formulated with a tasty, smaller sized kibble ideal for smaller teeth while appealing to even the fussiest eaters. Lastly, a range for specific health goals under the name of Royal Canin Health Nutrition is also provided by this premium dog food brand. 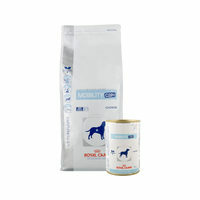 This product range consists of dry and wet food for animals with a particular health issue. For example, Royal Canin Sporting Endurance 4800 is specially designed for adult sporty dogs that have a very active lifestyle. Royal Canin is the trusted name that develops and provides precise Royal Canin puppy food and adult dog food to meet your pet's nutritional needs. Take care of the health of your pet by providing them with formulas that have been created after years of experience in science and observation. Whether its high-quality nutrients or tailor-made kibbles, buy what suits your pet the most.